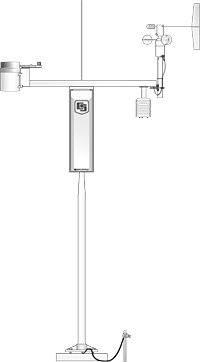 The ET106 is a pre-configured weather station that calculated potential evapotranspiration (ETo). Using our Visual Weather Software, you can easily calculate ETo using the measurements from the ET106 Weather Station. Designed for permanent installations, the ET106 can be found on golf courses and public locations where weather data is desired. Telemetry options that can be added are short-haul modem, telephone modem, and voice modem packages.